There are many types of knitters out there with many differing opinions on whether or not knitting should be kept or given, and if given, who should receive such lovingly knit items. Some believe that knitting is a precious and time consuming thing and you should really only knit for the one person who will truly appreciate it: yourself. Every time I gift a piece of knitting that I feel is unappreciated, I think about turning to this knitterly philosophy. But then, some sort of gift giving occasion will roll around and I will inevitably find myself casting on the greatest gift of all time. This is a bit pessimistic, there are many people in the world who appreciate a wonderful hand knitted item. These people should be loved and cherished and showered with knitted gifts until they are entirely clad from head to toe in beautiful woolies. But today I am thinking about a different kind of gifted knitting. This type of knitting is both giving and awareness raising and while there are many different knitting charities, today I’d like to share one: The Period of Purple Crying Prevent Shaken Baby Syndrome BC. This charity involves knitting purple caps for newborn babies in an effort to help new parents understand purple crying (when babies cry hard and long) and the damage that can be caused by shaking newborn babies. So, the only rules are that your hats must be delivered to the BC Children’s Hospital by November 5th and they must be purple. If you drop your hats by Urban Yarns by the 4th, we’ll travel them down to the BC Children’s Hospital for you. 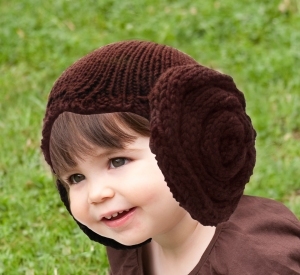 If you’re looking for an adorable hat pattern, check out this super adorable Princess Leia Hat by the charming Amanda. It’s done in the soft and washable Rialto Aran, 2 balls, and we just so happen to have 2 different shades of purple on Sale! Hooray! Our Special this week is Luxury Highlander at 40% off, regular $6.95 now $4.17. This entry was posted on Tuesday, July 27th, 2010 at 10:29 am	and is filed under Uncategorized. You can follow any responses to this entry through the RSS 2.0 feed. Both comments and pings are currently closed.